【Perfect Stereo Sound】 They are one pair with two speakers, 3W x 2 acoustic drivers, which delivering stereo clear surround sound.Great to be TV, home thrater or DJ speakers. 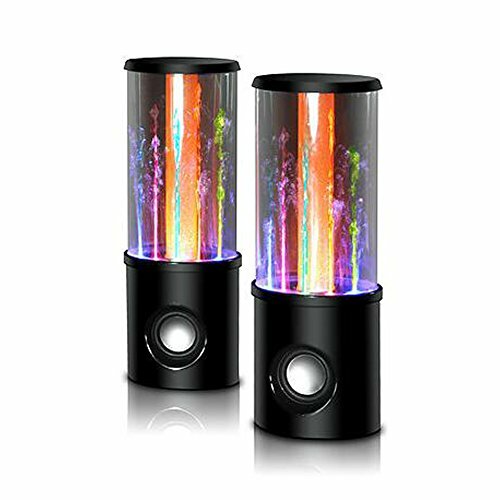 【Fantastic Water Dancing Fountain Speaker with LED Light Guide Tube Design】 6 multi-colored leds show you a fantastic colorful vivid world of music and light. Reflecting off the water as it shoots out of the base creating awesome visual effects. The center guide light tube shimmers like stars especially at night. The water fountain jets are controlled by your speaker's volume and create an amazing visual effect with dancing water and a multi colored Led light show. 【Plug and Play】 With 3.5mm connection port, it can be available for almost all kinds of Iphone, Ipad, Ipod, PC, Mac, Android phones and other audio devices. 【Best Gift and Home Decoration】 It is a good gift for your children or your friends. Attractive looks makes an excellent desktop companion that gives your home/office space a modern appeal. If you have any questions about this product by Aolyty, contact us by completing and submitting the form below. If you are looking for a specif part number, please include it with your message.